You can replicate Kubernetes masters in kube-up or kube-down scripts for Google Compute Engine. This document describes how to use kube-up/down scripts to manage highly available (HA) masters and how HA masters are implemented for use with GCE. MULTIZONE=true - to prevent removal of master replicas kubelets from zones different than server’s default zone. Required if you want to run master replicas in different zones, which is recommended. ENABLE_ETCD_QUORUM_READ=true - to ensure that reads from all API servers will return most up-to-date data. If true, reads will be directed to leader etcd replica. Setting this value to true is optional: reads will be more reliable but will also be slower. KUBE_GCE_ZONE=zone - zone where the first master replica will run. Note that the commands above create a cluster with one master; however, you can add new master replicas to the cluster with subsequent commands. 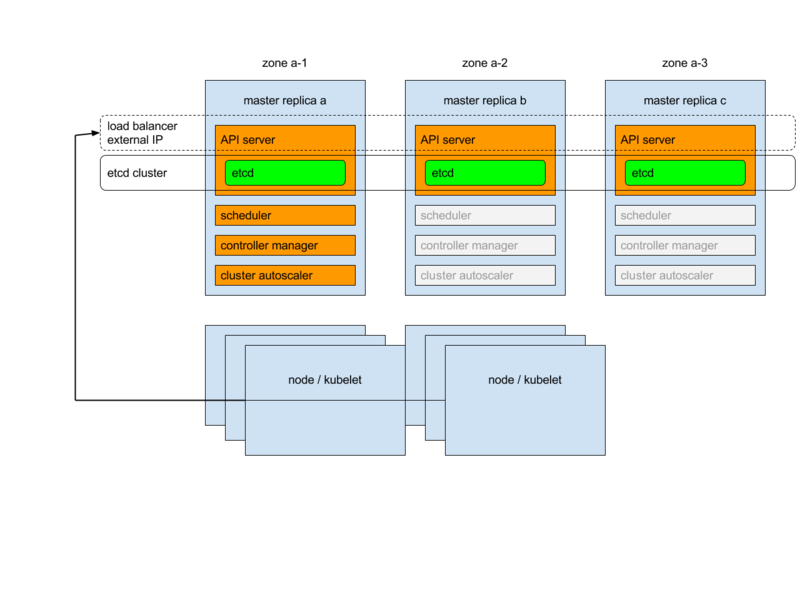 KUBE_REPLICATE_EXISTING_MASTER=true - to create a replica of an existing master. KUBE_GCE_ZONE=zone - zone where the master replica will run. Must be in the same region as other replicas’ zones. You don’t need to set the MULTIZONE or ENABLE_ETCD_QUORUM_READS flags, as those are inherited from when you started your HA-compatible cluster. KUBE_DELETE_NODES=false - to restrain deletion of kubelets. KUBE_GCE_ZONE=zone - the zone from where master replica will be removed. KUBE_REPLICA_NAME=replica_name - (optional) the name of master replica to remove. If empty: any replica from the given zone will be removed. Try to place master replicas in different zones. During a zone failure, all masters placed inside the zone will fail. To survive zone failure, also place nodes in multiple zones (see multiple-zones for details). Do not use a cluster with two master replicas. Consensus on a two-replica cluster requires both replicas running when changing persistent state. As a result, both replicas are needed and a failure of any replica turns cluster into majority failure state. A two-replica cluster is thus inferior, in terms of HA, to a single replica cluster. When you add a master replica, cluster state (etcd) is copied to a new instance. If the cluster is large, it may take a long time to duplicate its state. This operation may be sped up by migrating etcd data directory, as described here (we are considering adding support for etcd data dir migration in future). add-on manager: each manager will work independently trying to keep add-ons in sync. In addition, there will be a load balancer in front of API servers that will route external and internal traffic to them. When starting the second master replica, a load balancer containing the two replicas will be created and the IP address of the first replica will be promoted to IP address of load balancer. Similarly, after removal of the penultimate master replica, the load balancer will be removed and its IP address will be assigned to the last remaining replica. Please note that creation and removal of load balancer are complex operations and it may take some time (~20 minutes) for them to propagate. in multi-master cluster the IP points to the load balancer in-front of the masters. Similarly, the external IP will be used by kubelets to communicate with master. Kubernetes generates Master TLS certificates for the external public IP and local IP for each replica. There are no certificates for the ephemeral public IP for replicas; to access a replica via its ephemeral public IP, you must skip TLS verification. To allow etcd clustering, ports needed to communicate between etcd instances will be opened (for inside cluster communication). To make such deployment secure, communication between etcd instances is authorized using SSL.